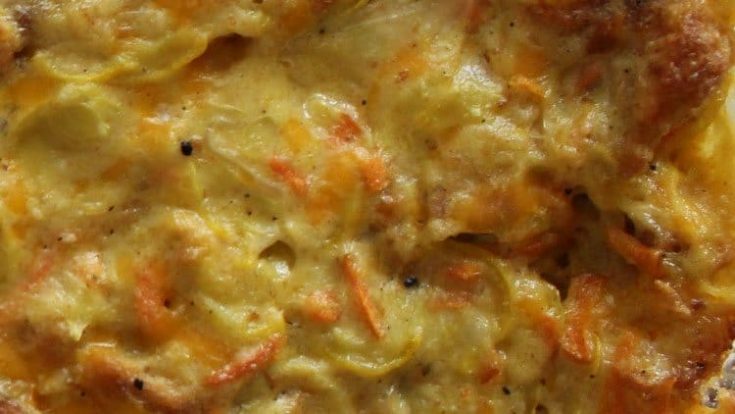 My absolutely favorite holiday recipe has always been squash casserole. I could have happily eaten it for dinner every night of the week, but mom always saved this dish for special occasions. This was a Christmas classic in our home, and occasionally a Thanksgiving side too. This savory, cheesy squash casserole is bursting with flavor. The original recipe contains pre-packaged herb seasoned stuffing mix and condensed cream of chicken soup, neither of which are gluten-free. When I developed gluten intolerance after my daughter was born, this was one of the first recipes I was determined to make gluten-free. All it took was a couple of simple substitutions to make a gluten-free squash casserole that is every bit as irresistible as the original! Making gluten-free stuffing mix from scratch is a cinch! Just cube the bread, toss with oil and spices, and roast in the oven until toasty. If you want smaller pieces, pulse the toasted pieces in a food processor or blender until desired consistency is reached. Making your own gluten-free condensed cream of chicken soup is simple too! Just simmer chicken stock, whole milk and cornstarch for about ten minutes on the stove. To make up for the additional time needed to make your own stuffing mix and condensed soup, I recommend using pre-shredded carrots and cheddar. Combine chicken stock, whole milk and cornstarch in a medium saucepan and stir until cornstarch is dissolved. Cook over medium heat, stirring constantly until bubbling. Reduce heat to low and continue to cook 5 minutes, until thick. Remove from heat. Toss gluten-free bread (cubed) with olive oil or use an oil sprayer (such as a Misto or Evo) to coat and toss with onion powder, garlic powder, salt and pepper (to taste). Thinly slice squash and cook in a large pan sprayed with olive oil, covered, on medium heat until softened and liquid is released. Mix sour cream and cream of chicken soup together in large bowl. Add carrots and squash (including liquid released during cooking). Mix in shredded cheddar and toasted bread. Spread mixture in a prepared 9x13 casserole dish. Bake at 350 for 40 minutes or until bubbly.